Deepcool has been introducing coolers, cases and fans nonstop. Now in Deepcool’s new Gamer Storm brand they bring us a whole new generation of fannage; the Deepcool GF120. It has an MSRP of $19.99/€19.99 but is it worth such a cost? 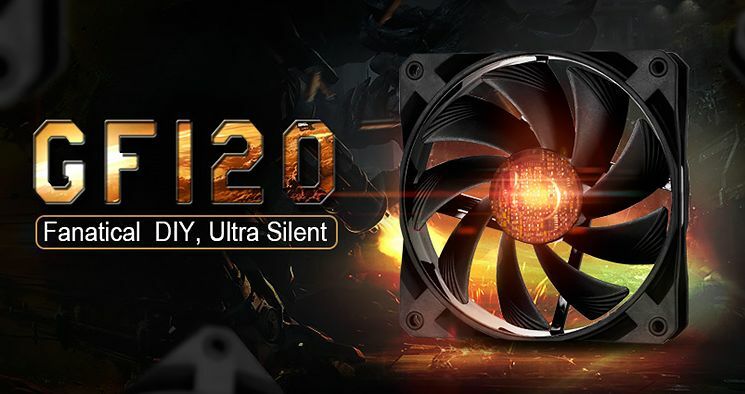 The Deepcool Gamer Storm GF120 is a 120mm PWM fan with a nine-bladed removable impeller. Despite the impeller being removable, the GF120 is waterproof, dust-proof and proof against oil leakage. The GF120 comes with a speed-reducing adapter and a set of four vibration isolators. The retail box and interior packing are cardboard, and fully recyclable. Established in 1996, Deepcool originally produced desktop and server coolers for ODM partners. With the rapid development of personal computers, Deepcool expanded the business into desktop cooling products and laptop cooling accessories. The evolution of this company has been awesome to watch. Back in 2012, I included their UF fans in an omnibus fan review. The fans were OK. They were pretty, even beautiful. They came with great accessories. They were all PWM, from the 80mm cuties to the 140mm, but their clicking negated any benefit you would get from the rubberized coatings all the fans had. Since then, they have greatly improved all their products every year - including their fans. And the remarkable thing is that they still make industrial products. Give yourself a treat by visiting this site and watch them carry on with the basic blocking and tackling of the computer world – stuff ordinary users never see.